At least 512 MB of RAM and enough free disk space for installation, recovered files etc. In order to install and run File Recovery Software, it is mandatory for you to be a member of the local administrator group or possess an equivalent level of rights. Most of the people prefer hard drive of a computer to store their vital files as it is safe and secured place when it comes to storing vital data. However, sometimes while accessing files from hard drive, you find out that some vital files are missing from hard drive. Since the crisis of file or folder loss is a very common in Windows or Mac operating systems as human follies, software conflicts etc cannot be ruled out permanently. Nevertheless when you click on Recycle Bin folder, you observed that Recycle Bin folder is also empty. In such critical instances, most of us think that the files and folders cannot be rescued anymore. But this is an erroneous notion!!!! Don’t be worried if this kind of crucial situation comes to you, as you can easily rescue files by using various tools. 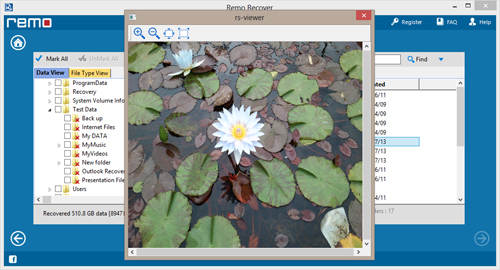 However, when it comes to rescue lost or deleted files and folders from computer hard drive, File Recovery Software is the ultimate tool in the marketplace. File system corruption is one of the major reasons for losing files from hard drive. It mainly occurs due to virus infection, improper system shutdown, power outage, and abrupt ejection of external storage drive while transferring data to/from the computer. In such circumstances, the files will get lost or deleted and results in critical data loss. Sometimes, formatting of hard drive is necessary, especially when the user wants to remove viruses which are wiped by antivirus programs. But, formatting the hard drive will erase all data present on it. In such cases, if you don’t have backup then you will lose vital files. When you connect removable storage drive such as USB flash drive to computer that has updated antivirus application, first it will scan the complete USB drive for viruses if it finds any harmful files, it deletes them. Some antivirus tools directly delete the entire folder that contains harmful viruses after scanning the USB drive. If that folder contains any important files then severe data loss crisis occurs. Irrespective of the cause, when you lose files or folders from computer hard drive it is strongly advised to stop using the drive from where you have lost the files or folders. Because if you save any new files on the same drive then deleted files and folders will be overwritten and recovery of such data becomes highly impossible. So, once you face any data loss crisis, just install this file recovery software for memory card and carry out the file recovery process. Effectively rescue all types of files like digital pictures, videos, spreadsheets, music files, ZIP archives etc. Simply perform lost file recovery and folders from SATA, SCSI, IDE hard disks, SD cards, CF cards, MMC cards, USB drives etc. Provides as advanced option to edit/add new file signatures which are not listed during file rescue process. 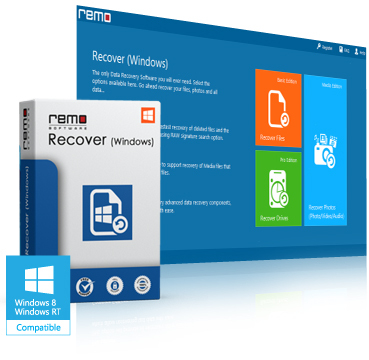 Using this software, you can recover files after system restore in few mouse clicks. Supports lost or deleted data rescue from all types of storage drives including FireWire drives, iPods, USB drives etc which can be accessed via Windows or Mac computers. Know about how to perform permanently deleted file recovery with ease. How to Troubleshoot Windows 10 Blue Screen? Step 1: Install this software and on launching it select "Recover Files" option from the main window in order to proceed further. 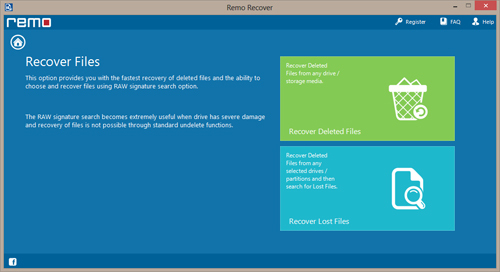 Step 2: On the next screen, you have to select recovery mode between "Recover Deleted Files" or "Recover Lost Files" from the main screen as illustrated in figure 1. 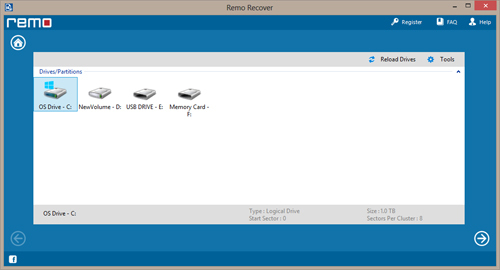 Step 3: On the next screen you will see a list of logical drives as illustrated in figure 2, select the drive from which you want to recover files. Step 4: Rescued files can be viewed using "Preview" option before saving them.